Forests and land-use remain a contentious issue in climate negotiations but are an essential part of many countries’ climate pledges. The sector should be used as an additional climate tool, not as an excuse to reduce ambition in others. What does this mean for countries’ climate commitments? If the countries’ climate commitments, the so called Nationally Determined Contributions (NDCs) are not transparent in how they account for land use, states could be checking boxes on their climate targets when in reality land is degrading and carbon pollution is increasing. For instance, Russia’s climate pledge under the UN climate negotiations assumes maximum CO2 absorptions of its forests which decreases the incentive to reduce emissions in other sectors and may even allow emissions to increase over time. New Zealand already has plans to change their forestry accounting rules to avoid repaying credits earned from forest planting when they are eventually harvested around 2020. It will be the equivalent to a full year of New Zealand’s emissions disappearing through accounting tricks! What does it mean for carbon markets? The serious questions about countries’ use of the land sector in their NDCs to cover up reductions needed in other sectors reflects the debate on the EU level. Credits from land use need a separate pillar to maintain climate ambition. When CO2 absorption from land, also known as negative emissions, contributes to the same target as other sectors it cancels the need for decarbonisation. Decarbonisation, however, is essential to reaching the Paris agreement’s target of limiting global warming to 1.5°C. 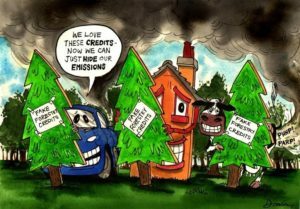 This is also the reason the EU has prohibited the use of land use credits in its emissions trading system. Markets are a measure that should increase ambition and allow for a cost-effective transition to a low-carbon economy. This can’t be done if offsets from land use are used as an excuse to stall much needed emission reductions.